Along the corner of Sgt. 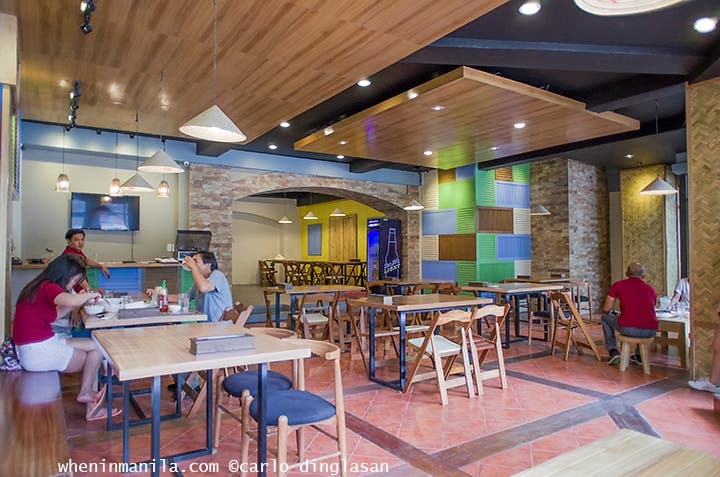 Esguerra and tucked away behind the shade of a handful of trees, is Quezon City’s newest Vietnamese eatery. 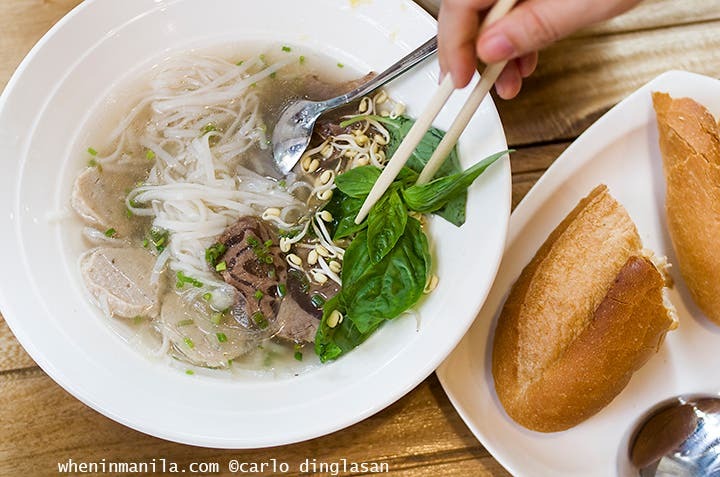 Only a few weeks old and tucked away in an unobtrusive little nook along Eugenio Lopez Drive, Saigon Corner is a homey little restaurant reminiscent of sunny days, Southeast Asian tradition, and the invigorating smell of homemade phở. Inside, around the length of a low, rectangular table, we talked for hours about Vietnam, about food, and also about Anthony Bourdain. This time last year, I was preparing to leave Manila for a trip to Vietnam. I’d spent two weeks flying over cerulean skies, pushing my way past the chaos of Hanoi and its babel of voices, swimming in the waters of Hoi An’s oceans, and then eating my way through the restaurants of Ho Chi Minh. Needless to say, by the end of the second week, I was three shades darker and deeply in love. A huge part of my amore stems from (surprise, surprise) the food. I never thought I’d have Vietnamese food as good as I had in those fourteen days. Filipinos just aren’t used to the Vietnamese palate and when you live in a city where the standard is Pho Hoa, it’s easy to become discouraged. Nothing against Pho Hoa, I’ve spent dinners there myself; but as we all know, the secret to Vietnamese food isn’t found in corporate food chains. Rather, it’s found in the freshness of the ingredients, in the tantalising smells and aromas of the herbs and spices, and in all the things that remind you of how grandma used to cook, should grandma have been Vietnamese herself. 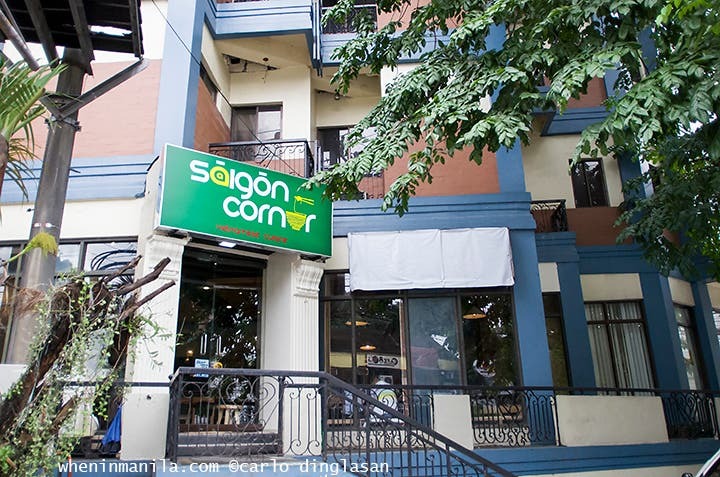 What’s special about Saigon Corner is that they have a story: the one that starts out with Eugene backpacking through Vietnam, meeting Thao in her coffee shop north of the country, marrying her three months later. Six years into the future, husband and wife are happily married with two daughters and decide to take the risk of opening up a restaurant: a tribute, Thao says, to the Filipinos who have welcomed and nurtured generations of Vietnamese boat people looking for a new home on these islands. It is a small but sincere thank you to anyone who has come from Vietnam or to anyone who has fallen in love with it. They also grow their own herbs, make their own mayonnaise, and bake their own bread. The kitchen is constantly at work with their three Vietnamese chefs, all of whom are masters of their craft. Not that I’d ever met them; I just tasted their food. Phở bò (beef brisket noodle), P265 for a large bowl good for 2-4. The meal starts out with phở bò (beef brisket noodle), of course. Classic and aromatic, we watch as Thao helps us prepare phở the right way: with bean sprouts, mint leaves, and a drizzle of citrus. It is a warm welcome indeed as we watch the rain fall behind us while sipping from our bowls. 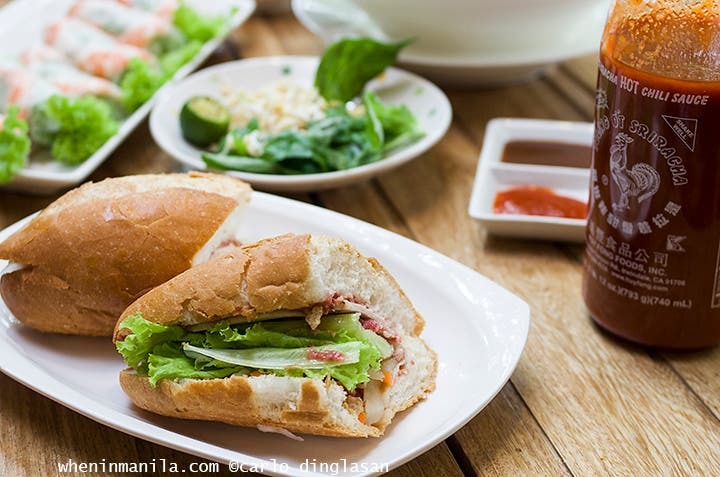 Manila’s #1 bánh mì, no doubt about it! We are also served with bánh mì, the traditional Vietnamese sandwich. Saigon Corner has partnered up with the man behind spot.ph‘s number one bánh mì in Manila so you know it’s good. What I love about bánh mì is that I’d never dream of eating the ingredients by themselves. Put together, however, it is absolutely delicious: a wonderful melange of meat, mayonnaise, pate, vegetables, and cilantro (you can request to remove this if you don’t like cilantro). Sandwiched between homemade bread that is crunchy on the outside and soft on the inside, it is the perfect, healthy alternative to the usual (and somewhat repetitive) Pinoy rice meal. Fresh seafood, anyone? Gỏi cuốn (summer rolls) for only P135! The gỏi cuốn (summer rolls) were wonderful, as well. Fresh shrimp, vermicelli, and pork wrapped in rice paper and dipped in peanut sauce, these rolls are made lovingly by hand. We even met the tita who makes them, a sweet lady dressed in bright yellow who spoke to us only in Vietnamese. We nodded our thanks while she sat next to us in companionable silence, beaming from ear to ear watching us savoring her creations. Hear that sizzle? 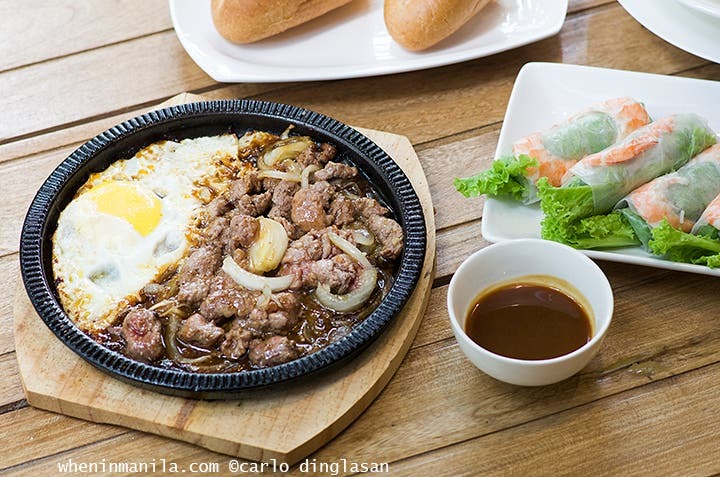 Bò né (sizzling beef sandwich) at P195 is your new lunch staple. The bò né (sizzling beef sandwich) was another star on the table. It is a deconstructed sort of sizzling beef sandwich served with egg sunny side up. You know the saying “sauce lang, ulam na?” That’s exactly what this is. Served to us on a sizzling plate with bánh mì bread on the side, the bò né requires you to eat with your hands and to swab your bánh mì in its savory sauce. Because the Vietnamese are so hospitable, they just had to fill us up. Our last course, as if all that wasn’t enough yet, was the sườn trứng. It is a pork barbeque slab served with rice and egg sunny side up. A classic dish, perfect for those who are only beginning to appreciate Vietnamese cuisine. If you’re looking for fusion food, look no further and order the gỏi góc sài gòn (house salad). It is made by a Vietnamese chef who spent years working around Japanese influences. 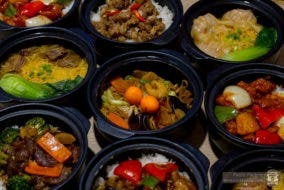 Taking a bite out of this dish will transport you out of Manila and into Vietnam, all the while reminding you of Japan. The star of the show. P148 for a tall glass of guyabano smoothie. 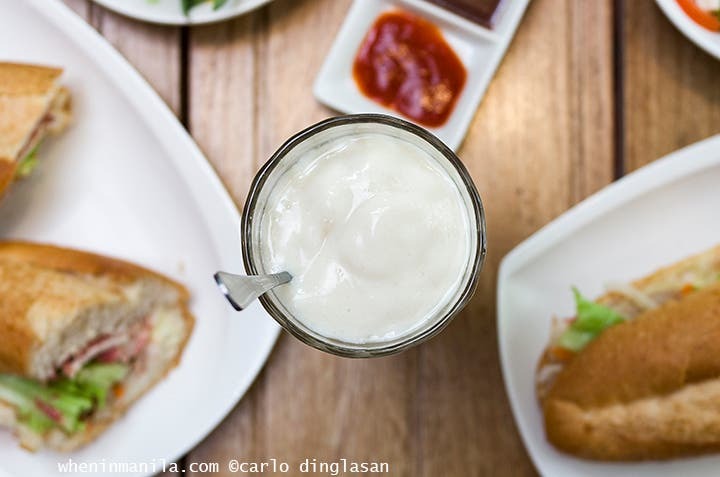 For drinks, we highly recommend the guyabano smoothie! I had to write that with an exclamation mark because it was that good. I slurped it all down and wondered where it went. It is Saigon Corner’s bestseller and signature drink, one that only they serve. The yogurt đá xay is another great choice, if you’re not into fruity drinks. It is homemade yogurt blended with ice and is the perfect cooler on a hot, summer day. Of course, you can never forget Vietnamese coffee! Vietnamese coffee served hot for P78. 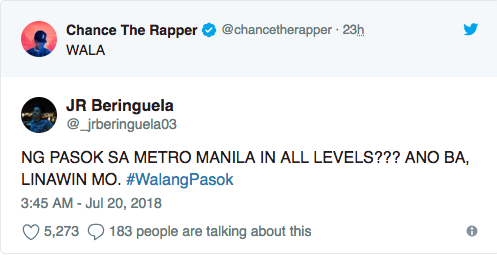 Perfect for the rainy season! We all ate our meal rather quickly, but we stayed long afterwards. We sat talking to each other and to Eugene and Thao, two of the most earnest hosts I’d ever met. They hoped we’d love their food, and they did their best to make sure we would. But the tableside conversation that came about after we ate was what I believe Eugene and Thao wanted all along. 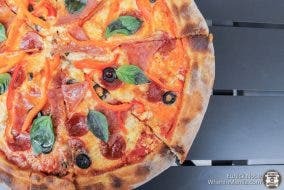 Yes, they wanted us to love their food, but I think more than that, they wanted us to experience the hospitality of another culture, to dispel the notions of “foreign” and to incite in us a curiosity of the novel. 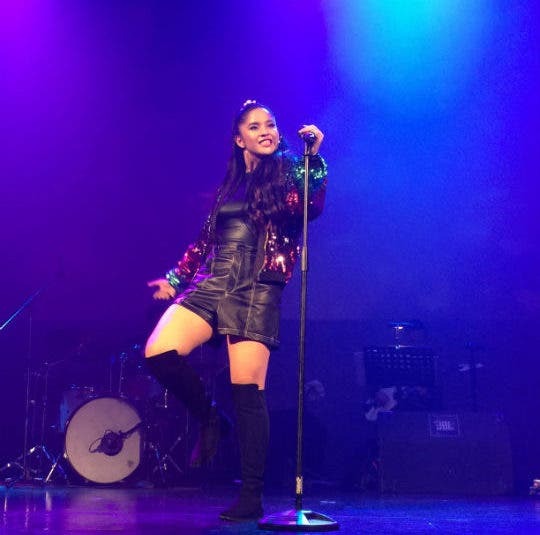 I’m not sure how the others felt, but watching their faces—their bright eyes and relaxed smiles—I’m sure they felt the same way I did: they felt at home. Slowly, but suddenly realizing it, I found that perhaps this corner of the world didn’t seem so far from Saigon, after all.